Nokia and Intel have joined up to marry their Moblin and Maemo platforms, creating the MeeGo spawn which will be seen on devices by the ends of the year. Another operating system? Moblin is, of course, the open source mobile Linux that's been seen on phones and netbooks with Intel's Atom processor. Maemo was seen on Nokia's N900, and was pretty much heralded as the savior for their phones, especially with the latest version, Maemo 6, expected to debut on some phones this year. While the jury is out on whether we need another mobile OS, MeeGo "will acelerate industry innovation and time-to-market for a wealth of new internet-based applications and services and exciting user experiences," according to reps from both Intel and Nokia, at a Mobile World Congress event in Barcelona. 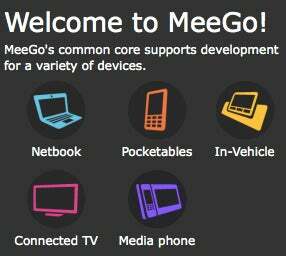 MeeGo currently targets platforms such as netbooks/entry-level desktops, handheld computing and communications devices, in-vehicle infotainment devices, connected TVs, and media phones. All of these platforms have common user requirements in communications, application, and internet services in a portable or small form factor. The MeeGo project will continue to expand platform support as new features are incorporated and new form factors emerge in the market.